This pattern has been done several hundred times by stitchers from all over the world. I can safely say we are all connected through this lovely little design. Check out all the photos, and there are a lot, to gain inspiration and knowledge if you are currently working on this pattern. This is stitched according to the instructions. The other photos here are my own thread ramblings. I love this close up shot, my stitches actually look pretty good here. Have a good look at it and see the recommended size of your stitching. 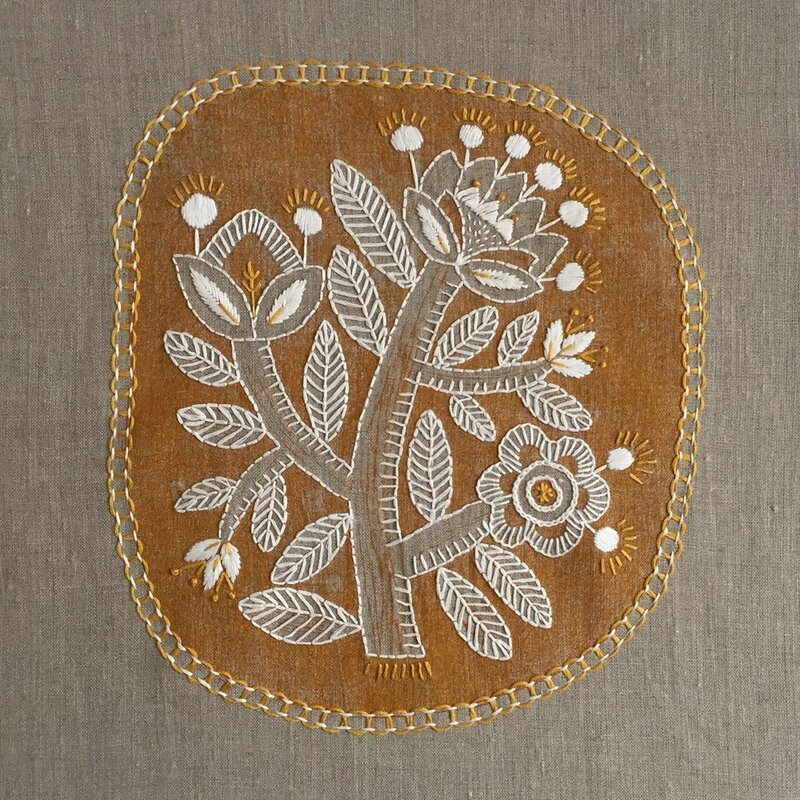 See how the leaves are outlined in a back stitch? Each stitch is the distance between the fly stitches, if that makes sense. It’s hard t explain in words. Also I’ve added little extra bits and pieces here and there that you can probably see which are not on the pattern. 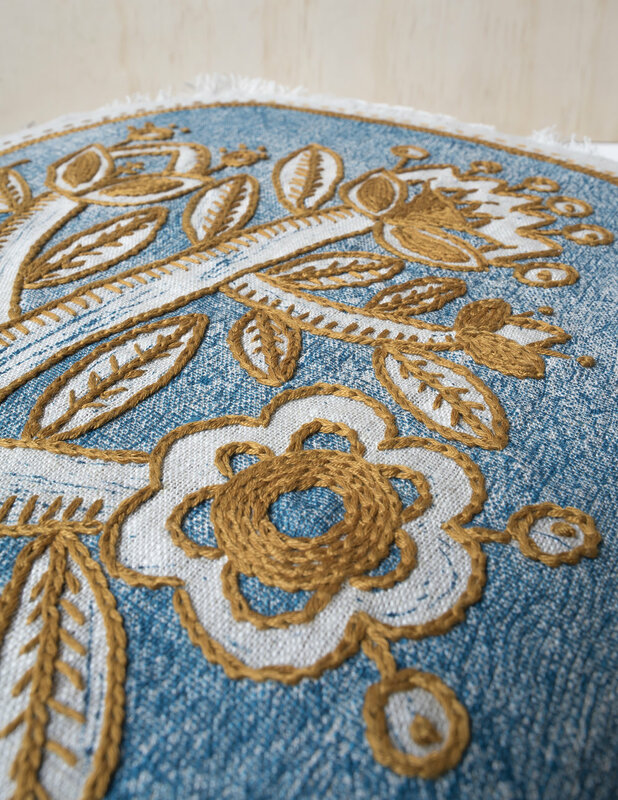 Oh also an important thing, see the chain stitch done in a circle here, I have a video of how to close up the chain stitch in a circle like this. If you haven’t done this before check it out on the videos page here. This is the actual pattern stitch for stitch. Nothing here that’s my own crazy addition.. I don’t think! Use this photo for a detailed look at all the stitches. Your kit might have come in a different colour, which doesn’t matter, the stitches are all the same and they’re nice and clear to see here. Super close up, maybe too much? But I did want to show you how you can go radically different with your own stitches. You can ditch my instructions and go your own way. 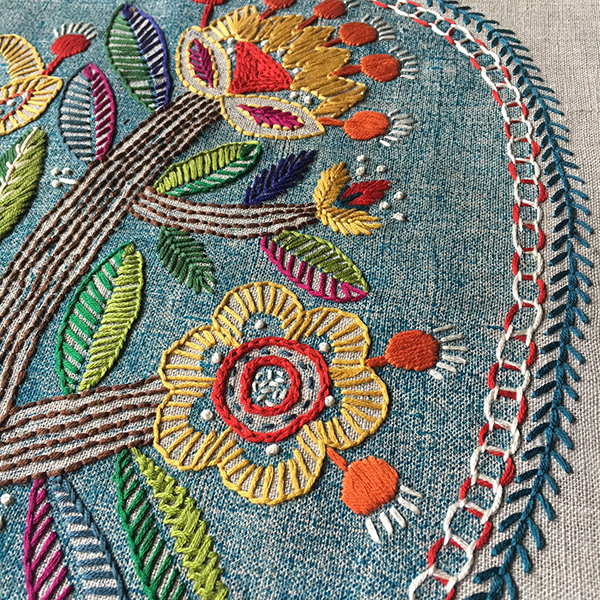 This is an example of lots of chain stitching, if that’s your kind of thing. And here it is with different stitches yet again! This was the most popular colour combination BUT I must confess I went a bit crazy with this one. In this photo you can see a billion different stitches and more colours than the kit actually came with… err.. sorry about that. I would show this to people in the hope that it would encourage them to go beyond the instructions but I think I just created confusion. Anyway, here is another possibility! Some of the stitches from the instructions ARE actually here. OK I just love this, I love it soooo much. The red on brown is delicious but look at those little seed stitches inside the petal! How lovely! You will also notice that I’ve used the herringbone stitch on many of the leaves here. Not in the instructions again, I know but if you’re proficient with this stitch then give it a go. Otherwise I will actually be putting together an online herringbone master class and you can join that when it becomes available.